This is worth gold – at least in jail. Photo courtesy of Collin Anderson via Flickr. You can always count on the St. Petersburg Times for a great story, but I never expected to find such a gripping narrative about honey buns. In the prison system, honey buns are a substitute for addictions, an effective bartering tool and, in some cases, a motive for murder. Paul Mason, who was once the world’s heaviest man, has filed a lawsuit against Britain’s health system for sending him to dietitians who did not diagnose his eating disorder, according to an article from the New York Daily News. I love sushi, but I’m not shelling out 250,000 pounds for a tuna fish like this wholesaler did at a recent Toyko auction. Words – who needs them? Starbucks is streamlining its logo by eliminating the company’s name and the word “coffee,” according to Reuters. Check out the logo here. What do you think? 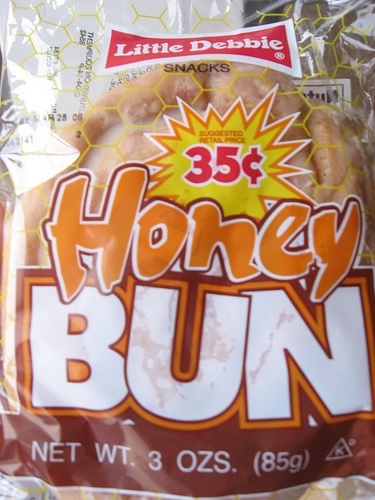 I swear, Ashlee, that article about Honey Buns is solid gold. Everything I could ever want in a news article. Thanks for linking it!